A couple of years ago I did a post on some remote and very small places, many of which had quite a lot of land and very few people. My point was to suggest that New Zealand was quite unusual in having so many people in such a remote spot, all the more so when much of the population growth had been accounted for by deliberate immigration policy. As readers will know – apart from anything else, I keep pointing it out – over at least the last 70 years, productivity growth here has been pretty poor and we’ve drifted a long way down the global league tables. My proposition is that the two stylised facts aren’t unrelated. At the time of the earlier post, my young daughter was fascinated by a book on remote islands. At the moment – a bit older now – she’s got really interested in Wales and keeps telling me all sort of interesting snippets. 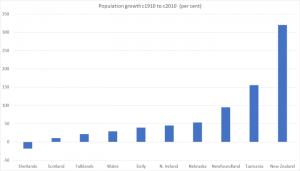 But talking with her about Wales reminded me that at the time of the Lions Tour last year I’d been meaning to write a post highlighting just how little population growth there had been in some of the outer reaches of the United Kingdom. More generally, I’d been thinking about how global studies attempting to assess the economic impact of immigration focus on comparing across countries. In some ways, that makes sense – data are often easier to come by, and countries control immigration policies. But I suspect there is information in the experiences of remote regions. After all, if there were typically really good economic opportunities in remote regions, people in a country are free to move there. The population of the United States, for example, has risen by over 200 million people in the last 100 years – through a mix of immigration and (mostly) natural increase. Those peope have been free to locate themselves where the best opportunities are. One can think of parts of Canada or Australia in the same way. And if our politicians had made different choices in the 1890s, we could simply have been part of the Australian Commonwealth, and it seems unlikely that the economic opportunities here would have been much different if that choice had been made. Here I’ve focused on the last 100 years or so. Why? Mostly because just prior to World War One New Zealand had probably the highest (or 2nd or 3rd highest) GDP per capita of any country in the world (per the historical tables put together by Angus Maddison). But it was also some decades ago from the first bag waves of colonial settlement (whether here, Australia, Canada, or the mid-west and west of the United States). At around 1 million people in the 1911 Census, New Zealand was already a functioning country of reasonable size (not large, but there are many smaller countries even today). Australia and Canada (and the US) have had rapid national population growth rates, but these remote regions (Nebraska, Newfoundland, and Tasmania) have had much lower population growth rates than New Zealand. (And, on checking, each of those three have lower population densities now than New Zealand does.) But given that all of these regions have small populations, relative to the respective nation’s total population, there would have been nothing to stop lots of people gravitating to the remote spots if there was real evidence of good economic opportunities for many people in those places. It has, after all, happened in some remote regions: West Australia for example, now has about 10 times the population it had in 1910, presumably attracted by the mineral resources that mean West Australia has the highest GDP per capita of the Australian states. And two really remote parts of the United States – which I didn’t show on the chart, partly because they were settled so much later (not admitted as US states until 1959) – are Hawaii and Alaska. Both have had faster population growth than New Zealand over the last 100 years (although between them only around 2 million people in total): in Alaska’s case no doubt the oil resources attracted people (Alaska also has among the highest GDP per capita of any state). But over that hundred years – or any shorter period you like to name really – New Zealand (like Wales, Northern Ireland, Tasmania, Nebraska, or Newfoundland) has had no big natural resource discoveries, or asymmetric productivity shocks specifically favouring our location. Like those places, we’ve only had the skills of our people and the instititutions we’ve built or inherited (in the case of this group a fairly-common Anglo set) to make the most of, and to overcome what appear to be the resurgent disadvantages and costs of distance/remoteness. Our birth rates won’t have been much different over long periods, and New Zealand like all these places – the Shetlands most extremely of the places on my chart – have seen outflows of our own people. The big difference here is immigration policy, which has actively sought to substantially boost the population. Try a thought experiment. Say the New Zealand and Australian governments had simply combined their respective immigration policies over the last 100 years or so (eg if New Zealand was offering 45000 residence approvals per annum and Australia 200000 – similar to the current policies – the two countries simply said we’ll issue 245000 residence visas and the arrivals can go wherever they like), what would have happened. By construction, the total population of the two countries would have been pretty much the same as what we actually see (5.4 million in 1910, and about 29 million now) but what would the distribution look like? We know that in Australia – given the same choice – the remote region with a mild climate and no big new natural resources (Tasmania) saw much weaker population growth than the rest of Australia. Why wouldn’t it be the case that New Zealand would have experienced much the same phenomenon? At Tasmania’s population growth rate for the last 100 years we might now have a population of around 2.5 million. 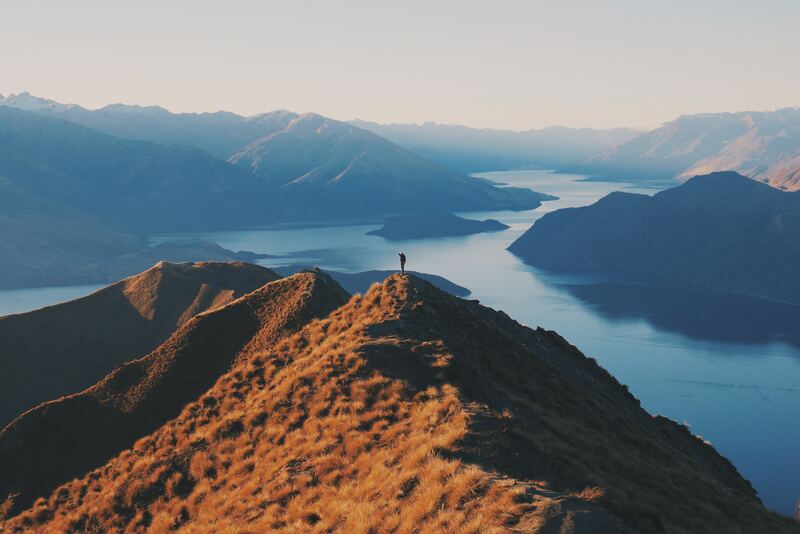 After all, for almost 50 years now native New Zealanders have (net) been relocating to (the non-Tasmania) bits of Australia, so why – given the free choice – wouldn’t the migrants – facing a free choice at the point of approval – have done so too? Would we have been better off? The migrants who went to Australia instead presumably would have been – both judged from revealed preference (they made the choice) and that incomes in Australia are higher than those here. I’d argue that the smaller number of New Zealanders probably would have been economically better off as well. Natural resources are still a huge part of the economic opportunities in these remote islands – perhaps still 85 per cent of our exports – and those limited resources would be spread across a considerably smaller number of people. For those who simply prefer “more people” for its own sake, perhaps they’d have been worse off – but then such people could have self-selected for Sydney or Melbourne (as Tasmanians of a similar ilk do, or people in Newfoundland who wanted to be part of something big self-select for Toronto). I’m not suggesting something conclusive here, just that people pause for thought, and reflect on what questions the experiences. For a remote place we aren’t particularly lightly settled, and especially not as a remote place without the sort of abundant natural resources of – say – a West Australia. We’ve had no distinctive favourable productivity shocks, and we’ve long lost any claim to be the richest (per capita) country on earth. It is no surprise that some people want to move here – plenty would want to move to Nebraska if it had its own immigration policy like ours – but there isn’t much evidence, from experience of other remote regions, to suggest we benefit from them doing so. Without big new natural resource discoveries, remote places – regions, territories – in the advanced world tend to have quite weak population growth rates. It isn’t obvious why in New Zealand we should let immigration policy up-end that otherwise natural outcome.